After a wait of over 20 years, Haze are finally back with a brand new studio album, featuring the classic line-up of Paul Chisnell and Chris & Paul McMahon, with the addition of Ceri Ashton and special guest Catrin Ashton. The CD features 14 new recordings, totaling over 72 minutes and was released jointly by Cyclops Records and Gabadon Records on 25th March 2013. With fantastic original artwork from Jilaen Sherwood. The CD is also be available at our concerts and through Amazon and Bertus distribution via Cyclops/GFT. I've put edited versions of the tracks online here and on ReverbNation. It is now also available for download from itunes & the like, including Amazon. You can order by sending a cheque for � plus �p&p (UK), or plus �(o'seas) to Haze, 25 Fir Street Sheffield S6 3TG, or order online here. Paul Chisnell - percussion, vocals. Recoding - Rode NT-2 mic, Focusrite Platinum Voicemaster, MAudio Delta 1010 soundcard, Sonar 4 on PC, Alen & Heath GS3 16:8:2 desk, Samson Rubicon R5a active speakers, Sennheiser HD 650 & Beyer Dynamic DT100 headphones. Chris Mc - Sei custom 5 string lefthanded bass, Aria Pro II fretless bass, 12 string acoustic, Ozark bouzouki, Hammond T500 tonewheel organ, Alesis QS7, Roland JP8000 & Roland D-20 keyboards, Roland U110 & MC505 sound modules. Paul Mc - Yamaha SF1000, Patrick Eggle JS Legend, Encore Mandolin, Antoria Strat Copy, Fender Stratocaster, Yamaha Nylon String CG-40A Acoustic, Patrick Eggle Linville Acoustic, Aria ST1512 twin neck, Epiphone 335 Dot, Albatross 4/6 twin neck, Schecter Diamond series 6/6 baritone twin neck, Fernandez Strat Copy, Roland G808 & GR300 guitar synthesizer. Pod FX and Line 6 combo. Paul Chisnell - Pearl Export double bass drum kit, Mapex kit, yambu, tambourine, congas, talking drum, shaker, rainstick. Paul Chisnell - drums, Paul McMahon - slide & lead guitar (Patrick Eggle), mandolin, vocals, Chris McMahon - 5 string Sei bass, bass pedals, 12 string acoustic & electric rhythm guitars, Ceri Ashton - wooden flute, Catrin Ashton - fiddle. This was the first song written after the Haze 30th anniversary gig. We were trying to come up with a set of folk/rock original songs for our ceilidh band The Outlandish Knights in the hope of breaking into the festival circuit, but most Outlandish Knights gigs remain weddings & private parties, where original material is not really welcome, so we added the song to the Haze repertoire. I think we played it live first at the Polish Club, Barnsley on 4th October 2008. Paul had been working on the song for a while, this was about his third set of lyrics & the song originally included the guitar tune "Hitchhiking" which appeared on the 30th anniversary CD as an intro to "Ophelia" and is often played by the Knights as a polka for ceilidh dancing. The fiddle/flute tune in the middle and at the end is one of Ceri's. Paul Chisnell - drums, vocals, Paul McMahon - guitar (fender strat & antoria strat copy), backing vocals, Chris McMahon - 5 string Sei bass, 12 string acoustic guitar, Ceri Ashton - wooden flute, Catrin Ashton - fiddle. From the same rehearsal sessions that spawned "The Last Battle". Paul Chisnell brought the lyrics & we jammed some chords to them in much the same way as we had with "Fallen Leaves". Paul (Mc) added the middle 8 chords & I came up with the lyrics for this section. We've not played it live often as Paul Chis struggles to sing & play it at the same time. Paul Chisnell - drums, Paul McMahon - Yamaha classical guitar, lead & rhythm guitar (Patrick Eggle), lead & backing vocals, Chris McMahon - bass pedals, piano, string & choir synths, Ceri Ashton - wooden flutes. One of the great things about computer recording is how easy it is to layer up multiple tracks, Paul came up with six harmony parts, each of which he sang many times, to give the big choir on the choruses. Paul wrote this in 2002 & we were playing it live by the time we toured Italy in 2003, it was featured at the 30th anniversary shows & is a classic Paul song with unpredictable chords & lyrics about death. And I will be with you forever. Paul Chisnell - drums, Paul McMahon - electric 12 string (Aria ProII) & fender strat guitars, vocals, Chris McMahon - 5 string Sei bass, bouzouki, vocals, Ceri - wooden flute, viola, cello, Catrin - fiddle. I wrote this in June 2004, demo'd it myself with help from Ceri on flute and a drum track stolen from Manic Street Preachers & put it on myspace. We played it a few times with Treebeard & brought it to the Haze set in time for the 30th anniversary. Originally sung by me - we have a "you wrote it, you sing it" philosophy - Paul wanted to have a go at it, so we alternated lines, harmonising the last line of the verse & the pre-chorus. This is the first song on the CD to feature the Ashton string section (the other is Classic Rock Bar) I scored a four part harmony for cello, viola & two fiddles for them to play. The song was inspired by the disappearance of Richey Edwards (Manic Street Preachers) in February 1995 and his presumed suicide, as his car was found abandoned at the Severn View service station, near the Severn Bridge. The title comes from an incident recounted here on Wikipedia "On 15 May 1991, he gained notoriety following an argument with NME journalist Steve Lamacq, who questioned the band's authenticity and values...... Lamacq asked of Edwards' seriousness towards his art, and Edwards responded by carving the words "4 Real" into his forearm with a razor blade he was carrying. We used to spell it 4 Real, but it just didn't look right in the CDs medieval font, so we reverted to 'proper' English. As Paul said, "if he'd have meant it, he'd have spelt it properly"! Where no one knows who or what I抳e been. Paul Chisnell - drums, talking drum, Paul McMahon - semi acoustic guitar (Epiphone), lead guitar (Patrick Eggle), vocals, Chris McMahon - bass pedals, piano, lead, drone, strings & choir synths. Ceri - wooden flute. Paul had a number of "work in progress" songs leading up to the 30th anniversary, but this was the only one with a complete lyric so we worked to get it finished & debuted at the show. Need I say unpredictable chords & lyrics about death? We will be together when they find us. Paul Chisnell - drums, tambourine, Paul McMahon - electric 12 string (Aria) & lead (Patrick Eggle) guitars, backing vocals, Chris McMahon - 5 string Sei bass, 12 string acoustic, hammond organ, piano, Ceri - clarinet, cello, viola, Cat - fiddle. This was my favorite haunt 2002-2005, I played at practically every Monday night open mic, plus gigs there with The Toastplant Project, CRF, Silverwheel, Treebeard, Haze & Strongheart. "Mad" Sass ran Tuxedo Blue & The Yorkshireman with partner Buffy before taking on the Jolly Buffer on Ecclesall Road and turning it into the Classic Rock Bar. It was a great place, often hosting all day barbeques and charity concerts for Bluebell Wood. In 2005 the landlords decided to demolish it & build flats. The demolition date kept being put back & Sass became stressed, mixing heavy drinking with the tablets he was on to counter the damage due to drinking. I played the last open mic on 4th April 2005, Sass was hospitalised soon after and on 9th June we were playing at the White Lion with Treebeard when Birley Mick told us he'd just come from the hospital where Sass had died earlier that evening. The rest is in the song. There was Buffy there was Toastie, the Ginger Twats, Birley Mick Bona & Martin, Hippy Phil, Slodge, Rob Tarana, Spider, Wolfie & Sarah. Little Chris, Fred, Lez, Anna & Ed, Sergio & Paul Pearson too! And a little old lady from the flats round the back, just don抰 tell the kids she抯 down the Classic Rock Bar. Music playing every night sass at the helm with a pint or eight of baccardi & coke his bike stood in the corner, hey you抎 better not touch! misfits, bikers, dreamers, musos, poets, & drummers too in the the Classic Rock Bar. And the greatest stage that I ever played, was on the sticky carpet at the Classic Rock Bar. We've lost more than I think we'll ever know, but you never know, not down the Classic Rock Bar. Paul Chisnell - drums (Pearl Export kit in the Laundry Rooms, Mapex M kit in the Cellar), Chris McMahon - fuzz 5 string Sei bass, Paul McMahon - Schecter twin neck baritone, Yamaha SF-1000 & Patrick Eggle guitars, vocals, Ceri - cello. This was one of the "work in progress" riffs Paul had kicking around before the 30th anniversary, but it never got finished. When Dave "Wedgie" Hadley offered us a cheap week in his Laundry Room Studios in February 2011 as "guinea pigs" to try it out before they opened commercially, I insisted that we added it to the list of songs we aimed to record. We roughed out an arrangement & me & Paul recorded it to a drum machine guide, with lead guitar taking the proposed vocal melody, so Chis had something to play to in the studio. Later Paul came up with the lyrics & we started playing the song with Danny (McMahon - Paul's son) on drums. Paul liked the John Bonham-esque tom-tom pattern that Danny played better than what we'd done in the studio, so we re-recorded Chis playing the verses on Paul's kit in the cellar & spliced it onto the choruses he'd played in the Laundry Rooms. Paul plays baritone guitar to get down to the low B's on the solo section (he even detuned it on one take to get the Bb on the chorus even lower). I was long, long gone. Paul Chisnell - drums & vocals, Paul McMahon - Albatross bass, guitars (Fender strat & Patrick Eggle), vocals, Chris McMahon - 12 string acoustic, backing vocals, Ceri - wooden flute, Catrin - fiddle. One of the oldest of the new songs, it was originally conceived as a comic folk parody. We started playing it with Treebeard, but were dissatisfied with 13 verses all the same (it might work for Bob Dylan...) so introduced a key change every 2 verses & alternating vocals between Paul & Chis. Treebeard never really got it, so we dropped it from the Treebeard set & tried it with Haze instead. The song is based on the legend of the Bargast of Paradise Square (where Paul & I have day jobs), who was reputed to have so scared a man on crutches returning from the Three Tuns pub, that he dropped his crutches, leapt the stile & ran for home. Paul was working late one night & postulates what would happen if the huge ghostly dog met the current inhabitants of the square. What manner of man can give off such a smell? I'll have you put down and your master I'll sue"
Now it's your turn to feel my teeth in your soul"
And said "This World has heard enough of your lies"
And you mistress loves only the size of your wad. For justice and mercy you care not one Groat"
Or be sure that you sins will rip your throat out! Paul Chisnell - drums & congas, Paul McMahon - Fender strat & Yamaha SF1000 guitars, backing vocals, Chris McMahon - 5 string Sei bass, vocals, Ceri - wooden flute. Well on the way to becoming one of our most over recorded songs, albeit in several different forms. I wrote it in 2000 & we recorded it for the "Forged In Sheffield" folk compilation CD in 2006. I then came up with a slow 6/8 version of the song for a performance I was asked to do in a short film, so when we got round to recording it for "Reel Ale" (the 2nd Treebeard CD) we combined the two versions. We then started playing it with Haze, and me swapping 12 string acoustic for bass, Paul swapping bass for electric guitar and Chis swapping Djembe for drum kit changed it from a folky number into a loose jamming funky piece. Also featured on the 30th anniversary CD. Paul Chisnell - yambu, tambourine, shaker, rain stick, Paul McMahon - Patrick Eggle acoustic guitar, mandolin, Chris McMahon - contrabass balalaika, bouzouki, hammond organ, Ceri - wooden flute, Catrin - fiddle. The newest piece on the CD. I wanted a short instrumental, perhaps on classical or echo guitar to replace the new-age-ish intro to "The Edge Of Heaven", which I didn't want to do on the CD as we'd already recorded it in this form twice - on the 30th anniversary CD (with Chis) and on the World Turtle "Haze" CD (with a drum machine). Paul showed me three pieces he'd written, a fast & complicated slip jig (9/8), a very melodic major key waltz, and this piece. This one seemed to suit the medieval mood we were going for, we messed with different time signatures, settling on 11/8, & ran through it & recorded it in one evening. Paul Chisnell - drums, Paul McMahon - Yamaha classical, Aria 12 string & Patrick Eggle guitars, vocals, Chris McMahon - Aria Pro II fretless bass, Hammond organ, string & choir synths, Ceri - wooden flute. Another contender for most recorded song. 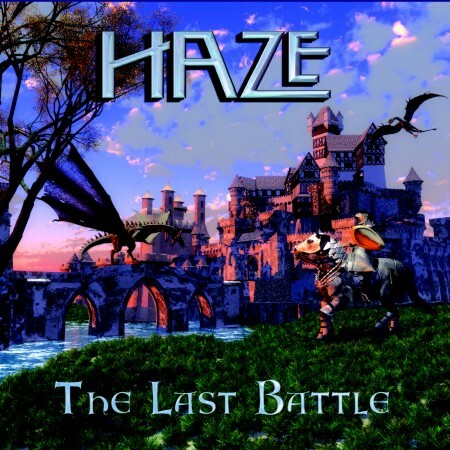 Written by Paul shortly after the breakup of Haze, it was first featured on the World Turtle "Alien Shore" cassette in 1989 with Fudge Smith (Pendragon) on drums and Alen Shaw (bass). We re-recorded it on the World Turtle 'Haze' and Haze 30th anniversary CDs. Chis double tracked the drums, first playing the 3 against 2 rhythm on hi hat & ride cymbals, then playing the rest of the drums over it. Paul Chisnell - drums, congas, shaker, wood block, Paul McMahon - wah-wah guitar (Fernandez), Chris McMahon - bass sequencer, 12 string acoustic, fuzz 5 string Sei bass, Hammond organ, various synth effects. Perhaps the least typical Haze song on the CD, we came up with the bass riff, groove and chords during a Strongheart session at Wilburs house, trying to come up with material for a third Strongheart album. The session wasn't very productive, we found we enjoyed cooking too much with Wilbur's Deep South Soul Food, Bob Mexican Cuisine & my Authentic English curries! Strongheart played a formative version at my 40th birthday concert at the Boardwalk, then Haze premiered the finished song at the Haze 25th anniversary concert in 2003. It was rarely played live as the sequenced bass part requires exceptionally good, preferably headphone, monitoring for the drums. I took the opportunity to experiment with the mix & sound effects on this one. The great guitar riff that comes in after the breakdown about 6 mins in was improvised by Paul on his guide guitar take, but I thought it was so good the song needed restructuring to feature it more heavily. If I sold my soul would I get a good price? If I told you lies would it make you think twice? Is that it? is that all you get? If I sold my soul would I get a good price? If I told you lies would you maybe think twice? Another day another year will I wait for you? Well what more did you expect? Paul Chisnell - drums, congas, shaker, Paul McMahon - echo guitar, lead guitar (Patrick Eggle), Chris McMahon - 12 string acoustic, bass pedals, mono synth (Roland JP8000), Ceri - whistle, Catrin - metal flute. A tune introduced to us by Canadian Christopher Rowan, he assures us it is part of the folk tradition of Greenland. We'd played a fairly straight folk version in The Outlandish Knights, but for Haze progged it up with our characteristic guitar & synth interplay. Everything after the false ending 4 mins in is completely improvised. Cat plays the metal flute on this one, with Ceri on whistle. Paul Chisnell - drums, Paul McMahon - Roland guitar synth, Fender strat, vocals, Chris - Sei bass, Hammond organ, Roland JP8000 synth. It was always a Haze tradition to include one old song on each of our albums - Mirage on "C'est La Vie" and The Vice on "Stoat & Bottle". The Red Room is the only 80s Haze song not to have a studio recording released (unless of course you delve back into the pre-Cellar Tapes days, oh dear are there some old songs from back then!). It was released on the 10th anniversary cassette, reissued on "In The End", and recorded again at the 20th anniversary (on the bonus disc). Towards the end of the recording process I was kindly offered an old Hammond Organ by Jarrod of iMonster, which I used on this track as well as Classic Rock Bar, The Edge Of Heaven & Is That It? It's also the only track to feature Paul on the guitar synth, which remarkably, still works after all these years!